Excellence. Passion. Innovation. Featuring the latest interior and exterior design trends in the décor and design space, The Design Show 2018 was a true celebration of why New Zealander’s are so often on the international stage. World renowned designers and architects, mixed with up-and-comers and consumers, showcasing a wealth of talent that is seldom seen in one venue. For some, (consumers and new designers alike), an event like this can feel overwhelming. But by taking a step back and looking at the wealth of opportunities on offer one by one, we were able to both generate new leads and make connections that will take us into new project. 1. Being there is everything. It was our first time at the event but as soon as we started packing in, it became clear that being available to meet and network with such a wealth of talent would provide opportunities that a million emails wouldn’t. The LyZadie Design Studio brand is about Rich, Raw, Real pieces and as head designer, Lyzadie encapsulates that ethos. Having her on the stand, meeting and speaking with other designers and consumers, gave people an opportunity to see where the brand comes from. To see her energy, feel her passion for this work. The creative spark is visceral and real, and seeing it in the flesh is always inspiring and exciting. Creative director, Lyzadie, by the Flow Dining Table. 2. It’s good to check in with the market. With such a broad range of world class products and design on display it’s easy to feel that your work is inconsequential. But allowing the market to react, in person, to our designs proved to be a great motivator to keep doing the work that we do. Interior designers and established furniture shops were very excited and happy to ‘finally’ have beautifully designed and high quality made in NZ products. Putting ourselves on display proved to us there is a gap in the market which we are providing a solution for. 3. New Zealand is on the world stage. For a tiny country at the bottom of the world, New Zealand has an amazing array of talent. And the world knows it. Social media is a reality of our daily lives, and also a recognized tool for marketing. So it pays to market yourself internationally from day one. While we pride ourselves on having locally sourced materials and being New Zealand made at LyZadie Design, our focus is on the international market. Instagram has been a great platform to explore this. Being showcased amongst so much talent helped us drive this international message home. 4. Everything we do showcases who we are. In an event of this quality, appearance is everything. So with our stand we didn’t leave anything to chance. Collaborating with Sara Black we wanted to make sure our design ethos was clear not just in our products but in how we showcased our vision on our stand. We wanted to give the public a feeling of being connected to nature, of living in harmony with our natural environment. In everything we do we aim to work with nature, not against it, so we brought some of that energy inside the giant conference centre. Using a living green wall, river stones, moving images and the sound of water rushing over rocks, we were able to achieve that environmental dynamic. Placing our pieces in that environment meant the luxury of natural materials, of exquisite and timeless design and craftsmanship was made even clearer. 5. Icons are icons for a reason. Karen Walker gave the keynote presentation with her usual eloquent poise and grace. Her eccentrically elegant style has established a stellar international following for her ready-to-wear, eyewear, jewellery, bags and fragrance (as well as a paint colour line for the New Zealand market). Seeing someone share her success story with such generosity is both an inspiration and motivation to push the boundaries of our design. And listening to her forecasts of upcoming trends in both fashion and interior design was enlightening. She has achieved so much for a reason, the woman is a powerhouse of ideas and creativity. 6. Did we say being there is everything? There were a huge number of exhibitors at the Design Show and we learned so much from every single person we met. Being surrounded by one’s peers in an intensely focused short space of time can sometimes be a formula for stress, but this format provided an outlet for the exchange of ideas and contacts. Pack ins were quick and efficient and everyone was supportive of each other’s vision, looking to help, share, learn and grow in any way they could. 7. New Zealand is small in size, big on impact. It only takes a quick scan of the program to see the wealth of talent available in New Zealand. It was invigorating to see so many brands celebrating the unique aspects of living in New Zealand. There is nowhere like it in terms of nature, scale, people and culture, so rather than suffering from cultural cringe, it’s worth celebrating everything that New Zealand has to offer. 8. We have something relevant to say. It’s always a challenge bringing a new collection to the world. This was our first time exhibiting our new Flow Collection and it proved to us that we do have a message about sustainability in the luxury market that is relevant and important. Launched in March 2018, our Flow Collection samples the elegant lines of New Zealand’s South Island braided rivers in many of its forms. The warm glow of molten brass twists and turns like a living river through the timber base and serves to only heighten the glorious tones of the rescued river Rimu used in each piece. Because sustainability is at the core of what we do, there is a location marker under each product in our Flow Collection. These pieces provide the coordinates of the exact location where the rescued timber in the design comes from. Not only did we receive amazing feedback from trade and consumers alike, but we were privileged to become a finalist in The Best Design Awards from The Design Institute of New Zealand. The Best Design Awards is an annual showcase of excellence in graphic, spatial, product, interactive and motion design along with four boutique awards. A wonderful reminder that we are on the right path. Watching people touch and caressing the tables over the three days of the show was a priceless boost in our confidence to keep being true to who we are and creating from our souls. 9. When life gives you and opportunity, take it. 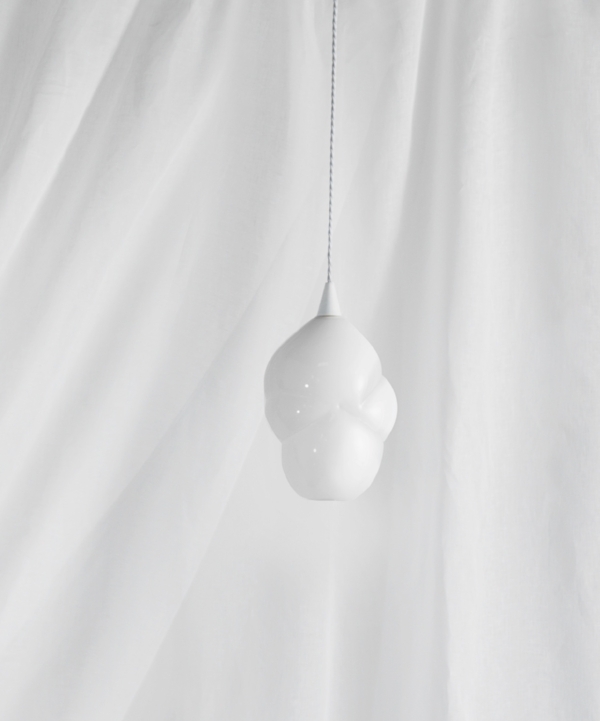 We hadn’t launched our Cloud Pendants from the White Cloud collection prior to the Design Show, but given the wealth of feedback we were likely to receive, we decided to put them on our stand. Inspired by the Long White Cloud New Zealand is named for, these pendants can be used individually or in groups. The original derivation of Aotearoa, the common Maori word for New Zealand is not known for certain. There are many theories, legends and stories around it. We loved the idea of early Maori travelling to New Zealand and seeing a cloud in front of them. Imagining chief Kupe call out “He ao, he ao!” (the cloud, the cloud) as he saw a long white cloud in the course of the day and a long bright cloud at night hanging over a distant land mass, created the spark that produced the Cloud Pendants. White glass, cloud like forms, floating about a distant land, these are our newest creation and we were so grateful to everyone who gave us such immensely positive feedback. We think we are on to something so look out for them soon! 10. And in case you missed it…Being there is everything. We received so many leads for future sales, publicity, and collaborations at the Design Show. And more importantly it was a great opportunity to soak up creative energy for the future. According to Karen Walker, in this business “you need to be open to a lot of ideas”. We couldn’t agree more, and came away with so much motivation to keep working and creating. Being there is everything so we have nothing but thanks to the team behind The Design Show for creating such an internationally relevant showcase for New Zealand design.